If you’d like to connect with other women at Strata, you’re invited to our networking luncheon on Wednesday. Clare Gollnick is the CTO and chief data scientist at Terbium Labs, an information security startup based in Baltimore, Maryland. As a statistician and engineer, Clare designs the algorithms that direct Terbium’s automated crawl of the dark web and leads the crawler engineering team. Previously, Clare was a neuroscientist. Her academic publications focus on information processing within neural networks and validation of new statistical methods. Clare holds a PhD in biomedical engineering from Georgia Tech and a BS in bioengineering from UC Berkeley. Ziya Ma is vice president of the Software and Services Group and director of data analytics technologies at Intel, where she is responsible for optimizing big data solutions on the Intel architecture platform, leading open source efforts in the Apache community, and bringing about optimal big data analytics experiences for Intel customers. Her team works extensively with internal product teams, the open source community, the industry, and academia to further Intel’s efforts in the big data analytics field. She is also a cofounder of the Women in Big Data Forum. Ziya was honored as one of the “women of the decade in data and analytics” by the Women Economic Forum in 2018. Ziya holds a PhD and MS in computer science and engineering from Arizona State. 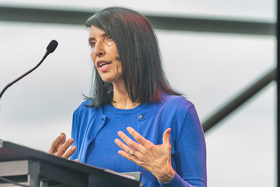 Karuna Mukherjea is senior director of product marketing at SAP, where she is responsible for the marketing for the SAP Leonardo portfolio that includes machine learning, artificial intelligence, and predictive analytics. Her product marketing team drives success for these solutions in the marketplace through new product launches, product messaging, and evangelism with customers, partners, thought leaders, and analysts. They also support the execution of effective lead-generation programs through new business and customer-focused activities like events and PR. She has been with SAP since October 2008 working on an extensive portfolio of solutions in the Analytics and Emerging Technologies space. Previously, she worked in product strategy for key technology solutions to support high-value business processes at Oracle. Karuna is passionate about driving programs and initiatives that will bring diversity and inclusion in the workforce. She is a board member and trustee at Woodland School in California. Karuna holds a master’s degree in finance from the Rochester Institute of Technology, a master’s degree in commerce, accounting, and finance from Osmania University, and a bachelor’s in commerce and accounting from St. Francis College. 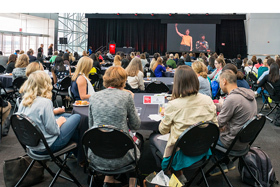 This event is open to all Strata Data Conference attendees with a Platinum, Gold, Silver, Bronze, or Women in Big Data Lunch* pass—there’s no need to RSVP. We’ll see you there. 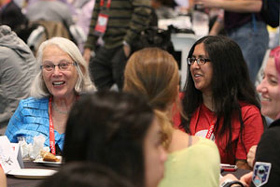 *The Women in Big Data Lunch pass is being distributed by the Women in Big Data Forum. Hi Ally, there are a limited number of the Women in Big Data Lunch passes, and they are being distributed to members of the Women in Big Data Forum group; they are not available to the general public. Platinum, Gold, Silver, and Bronze pass holders also have access to this lunch. Hi there, I’d love to register for this lunch, although there’s no signup option on the Women in Big Data Forum linked above. Can you please let me know how I can register? Thanks!